withdrawn Nov 10, 1971The following is the text of an IBM Data Processing Division press release distributed on September 23, 1970. In a major departure from conventional computer technology, International Business Machines Corporation today introduced its first computer using a main memory made entirely of monolithic circuits. To store its data and instructions, the new IBM System/370 Model 145 uses silicon memory chips, rather than the magnetic core technology that has been the mainstay of computer memories for the past 15 years. More than 1,400 microscopic circuit elements are etched onto each one-eighth-inch-square chip. Monolithic circuitry also is used throughout the Model 145's central processor to perform all of the system's arithmetic and logic functions. "When we introduced System/370 three months ago," said Thomas J. Watson, Jr., chairman of the board of IBM, "we thought it would do very well, but it has done even better than we expected. We believe that Model 145, with its significant advance in technology, the monolithic main memory, will make the capabilities of System/370 available to an even wider range of users." With the Model 145, many more business and scientific users can obtain the increased performance-per-dollar advantages of System/ 370. They will not have to reprogram their existing applications written for System/360 and earlier IBM computers. The first models of System/370, the 155 and 165, were introduced in June for users of larger systems. "In the Seventies, up-to-the-minute information from a computer data base is as vital to the people who run medium-sized organizations as it is to those who run large ones, "said F. G. Rodgers, president of IBM's Data Processing Division. "The Model 145 has all the characteristics needed to make advanced data base applications practical and profitable for intermediate system users." "The innovative technologies in Model 145 represent significant engineering achievements," Mr. Rodgers said, "but even more important is how they add up to better performance, efficiency and economy for the user." One of the key advantages of the Model 145 for multiprogramming and data base applications is its ability to use IBM's newest and fastest disk storage devices. They include the IBM 3330, announced in June, and a new disk storage facility, the IBM 2319, announced today. The 2319, available only with the Model 145, has a capacity of 87-million characters of information, expandable to 233-million. It attaches to the central processor, thereby eliminating the cost of a separate disk control unit. Equally important are new program products announced today for handling data base applications using remote terminals. IBM's Customer Information Control System (CICS), previously available only for large systems, will be available in two Disk Operating System versions. They are designed to assist users in speeding such information as customer account records, inventory status, production and engineering data and student records to where it is needed, while allowing the files to be updated directly from the computer terminal. In conventional memories, data is stored in magnetically charged cores strung on wires. The use of monolithic memory technology, with its very high circuit density, allows IBM to offer Model 145 users more than a half-million characters of high-speed storage in about half the space that would be required by core planes for an equivalent amount of memory. The more than 1,400 circuit elements on each monolithic chip are interconnected to make up 174 complete memory circuits. IBM has pioneered the use of monolithic memory technology in its highest performance computers, which include System/370 Models 155 and 165 and System/360 Models 85 and 195. In those systems, monolithic memory technology is used in high-speed buffers that match the speed of very large main core memories to that of the central processors. The Model 145's internal operating speed is up to five times faster than that of the widely used System/360 Model 40, and up to 11 times faster than the Model 30's. Users have a choice of six main storage capacities, from 112,000 to 512,000 characters -- twice the maximum available with System/360 Model 40. The ability to run programs written for earlier IBM computers, including the 1400 Series and 7010, is provided with the Model 145 at no additional charge. Users can also run Disk Operating System programs under control of the more powerful Operating System without reprogramming. Another innovation that enhances the Model 145's efficiency is a reloadable section of monolithic memory that augments the main memory. It is called Reloadable Control Storage (RCS). The code for the basic System/370 instruction set, including all system control functions, is stored in the RCS. Users will be supplied with a prewritten disk cartridge containing all needed instructions, as well as those for selected optional functions. Options might include the instructions that enable the Model 145 to emulate earlier IBM machines or perform arithmetic with extended precision to 34 decimal digits. The console operator can load instructions from the disk cartridge into RCS in about 45 seconds. The standard 32,000 characters of control storage provided with each Model 145 can be expanded to 64,000 by using a portion of main memory, if needed, to accommodate optionally available functions. 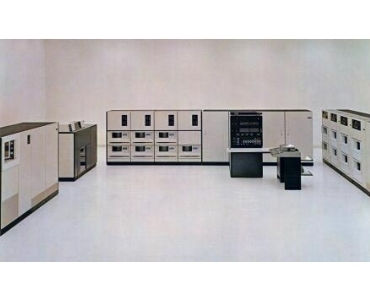 Monthly rental for typical configurations of IBM System/370 Model 145 will range from about $14,950 (with 112,000 characters of main memory) to $37,330 (512,000 characters), with purchase prices ranging from about $705,775 to $1,783,000. Initial customer shipments will be scheduled for late next summer. The Model 145 is in production at IBM's Endicott, N.Y., facilities, where it was developed. It also will be manufactured at the IBM World Trade Corporation plant in Mainz, Germany. The monolithic memory technology was developed by the IBM Components Division. The memory circuits are in production at the division's Burlington, Vt., plant. Complete monolithic memories are being assembled by IBM's Systems Manufacturing Division.